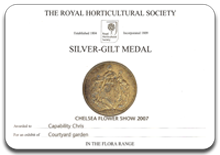 I have now designed and built three courtyard show gardens at the RHS Chelsea Flower Show. In 2007, the first, and close to my heart, was Shinglesea, inspired by the gardens of old railway carriage holiday homes along the coast in Sussex. 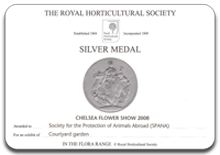 The second was sponsored by SPANA (Society for the Protection of Animals Abroad). 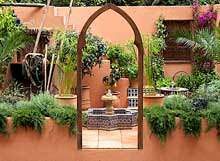 It represented a plant filled riadh in Marrakech and included a handmade donkey cart which was key to alerting visitors to the existence of the charity. 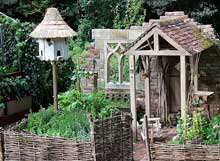 Then in 2009, The Pilgrim’s Rest, the ruins of an old monastery, was filled with delightfully scented herbs. 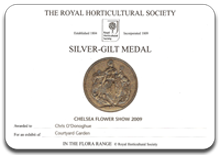 I was honoured to be awarded two Silver-Gilt and a Silver medal for these gardens. Set in a sheltered valley in the south-east of England, en route to Canterbury, the garden is backed by a ruined stone wall of a chapel which gives shelter and warmth. A central covered walkway, leading to an ancient door, provides a space for drying herbs and cover for visitors. A flower-studded, turf-covered seat, built of timber, provides a resting place. The garden is fenced by stock-proof, split hazel hurdles which are also used to form the raised beds. Read more about Pilgrim’s Rest and view the picture gallery. SPANA is one of the world's oldest international veterinary charities, providing practical care for around 380,000 working animals a year in 8 countries in North Africa and the Middle East. If you live somewhere like Mali or Ethiopia and your camel or donkey is sick, that might mean your family going to bed hungry that night. So where do you turn? Read more about SPANA’s Courtyard Refuge and view the picture gallery. Shinglesea was designed to represent a seaside garden along the south coast, using plants, not only easy to manage but, more importantly, to be drought tolerant. Most of them will survive with little or no watering, a major concern as summer rainfall becomes more unpredictable and winters are drier. Interestingly, there has been a solution to this seemingly modern problem for nearly a century as the gardens in the area that provided inspiration for Shinglesea have long featured plants particularly adapted to drought conditions. 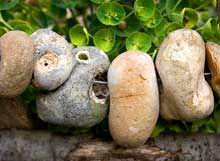 Read more about Shinglesea and view the picture gallery.